"Faith is not about belief in something irrational or about a blind connection to something unreal. It's about a gathering, an accumulation of events and experiences of a different order . . . the longing a soul has to find its shape in the world." Nora Gallagher entered Trinity Episcopal Church as a tourist and ended up a pilgrim. What she wanted was peace, she thought. What she got was something entirely different. In this remarkable book she describes her journey from secular life into "the world of the almost known," the world of faith. With her piercing powers of observation focused inward on herself and outward on her community, Nora Gallagher takes us into a year of her own spiritual searching and into the life of a parish church. During this year, Gallagher struggles with faith in the midst of community, a fatal illness in her family, homeless guests in the church soup kitchen, and the efforts of a priest who is a gay man and the church's vestry to decide whether he should be called as their rector. As Gallagher sits with a friend dying of AIDS and another with cancer, serves communion wine at the altar, locates buckets for the Holy Week foot washing, and copes with homeless men and women and their critics, we learn with her that "the road to the sacred is paved with the ordinary." Gallagher writes of faith and its meaning and the need for ritual and sacrament in the generous language of uncertainty, suffering, grace, and commitment. She continually reveals in her choice of metaphors her own emerging faith and one experiences her discovery, as it were, in real time. She gives us, as well, a beautifully rendered portrait of a community struggling with change, without ever losing sight of the cross. Perceptive, candid, and wonderfully written, Things Seen and Unseen embodies the demands and rewards, the mysteries and realities, of both personal and communal faith. "Gracefully written and moving . . . 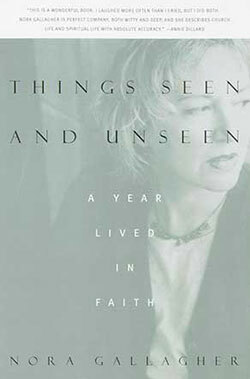 Things Seen and Unseen starts with Nora Gallagher entering the labyrinth of her life . . . and ultimately it leads to the center of her being." "Like Kathleen Norris in Amazing Grace, Gallagher is renewing the language of ultimate concerns." "This is a wonderful book. I laughed more often than I cried, but I did both. Nora Gallagher is perfect company, both witty and deep, and she describes church life and spiritual life with absolute accuracy." "The story of a 'thin place,' this book is itself a thin place where the boundary between the sacred and the everyday becomes soft and porous, and the veil lifts. An absorbing, compelling, insightful and poetic narration of a year in the life and lives of a mainstream congregation, it mediates 'things unseen' through The seen. A book of exceptional excellence." If you’d like to order books for resale, please contact Random House customer service for information on minimum order and competitive sales terms. Random House ships free freight.